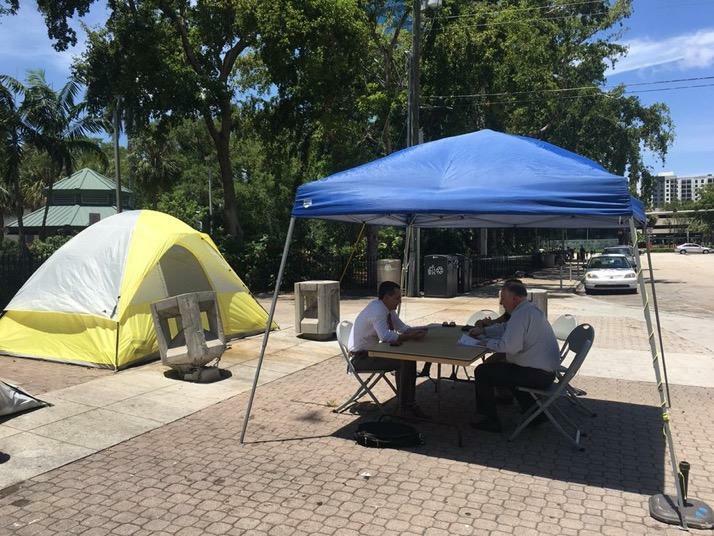 1 year ago, in the aftermath of the City of Fort Lauderdale's semi-secret meeting at the Women's Club, and subsequent raid on the homeless camp at Stranahan Park, future Mayor Dean Trantalis called that raid a "disgrace" and "shameful." Earlier this month, the new City Commission gathered for another annual "visioning workshop" at the Women's Club, which has a front row view of the activities at Stranahan Park, and talked again about how they would again "eradicate" the homeless camp in the next year. Therefore, it's somewhat surprising that no one at all has reported on many of the concrete plans that were expressed at this year's visioning workshop in regards to the homeless. Some of them seem pretty progressive. Some of them are more like a slap in the face to people who dealt with these commissioners in their past lives as minority voices in City politics. 1. The City's proposed "Community Courts" are being readied in order to dismantle the camp at Stranahan Park. This was pretty obvious from the beginning, but the City made it clear at this workshop that they do not think kicking people out of the library will do any good until they have this new program in place to get them in touch with social services. Of course, once all this happens, what happens with those that reject those services...? Either way, it seems like the people of Stranahan Park have until at least the fall before the City comes to shut them down. 2. The City IS moving forward on a new day shelter project in downtown. AIDS Healthcare Foundation, which already has offices in downtown, is ready and willing to use their own funds to build a new day shelter on their properties just south of the County Courthouse. The property needs to be approved for re-zoning, so this project will likely come up at City Commission in the coming months. Again, the fact that *absolutely no one has reported on this project,* that advocates have been pushing for for years, is beyond us. This is the first time that this much specific information about this project has been heard in public. 3. Despite a lot of good talk in recent years, the new, "nicer" commission does not have any intention of repealing the infamous homeless hate laws. Mayor Trantalis, the sole vote against some of these laws in the past, doesn't seem to have a problem with them anymore, and Commissioner Sorenson, who even advocated for these laws to repeal as he campaigned for office, seems to have backed down as well. During the Visioning Workshop, Sorenson specifically brings up the sharing ban and essentially advocates for enforcing it again in the future, pending on-going litigation in Federal and State courts (which will likely not be ending anytime soon). 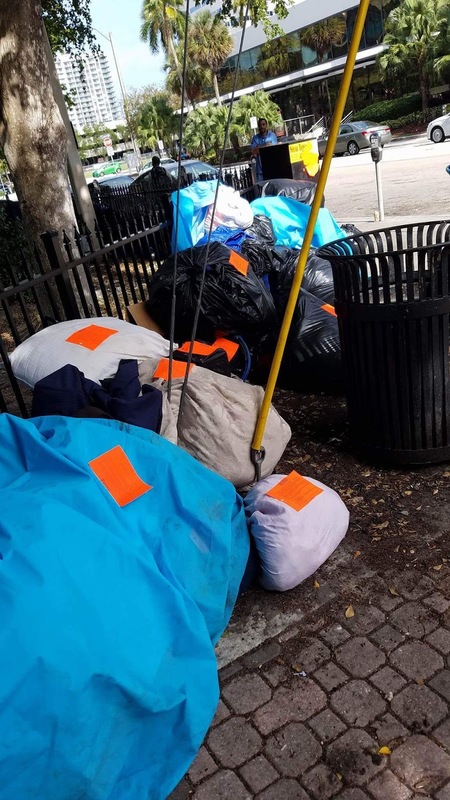 The enforcement of all the other anti-homeless laws came up as well, and one by one, the Commissioners advocated for the continuing enforcement of laws that criminalize panhandling, camping, and storage in downtown. But they also verbally exempted the sprawling homeless camp at the downtown library, due it being on County property, and due to the aforementioned plan for dismantling the camp through the "Community Court" project. However, it is also worth noting that there was talking about the County themselves adopting tougher anti-camping laws that could have an impact on the future of the camp regardless. The City has had very, very litle to say in public about homeless policy since the elections - but it was spelled out very well for those that could afford to spend 2 whole weekdays hanging out at the Women's Club. 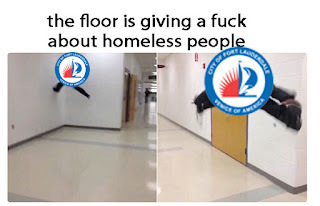 There's still a lot to unpack from what all this means for the future of the homeless residents of downtown Fort Lauderdale. But it seems clear, at this time, that the new Commission will not be much different that the old one when it comes to criminalizing homelessness. The City of Fort Lauderdale is quietly passing a revised version of its infamous 2014 sharing ban on Tuesday, August 22nd, its next City Commission meeting. If passed, it will go into effect immediately. The first reading occurred at approximately 3 am at the last meeting on July 12th, with no discussion from Commissioners. The original sharing ban, which repeatedly targeted homeless aid groups Fort Lauderdale Food Not Bombs and Love Thy Neighbor, brought international scorn on the City of Fort Lauderdale. Due to the extreme lack of attention this new law has gotten, it seems probable that they may again attempt to enforce this sharing ban law against homeless aid volunteers in the near future. The City also recently raided Stranahan Park's camp and displaced it, and they are subject to yet another lawsuit over this egregious rights violation. Even more recently, it has also installed more foliage in the area of Stranahan Park. The intent is to try to continue to push the homeless people onto the Broward Main Library property, to absolve themselves of any responsibility. 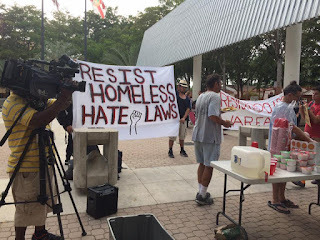 Fort Lauderdale Food Not Bombs is hosting the following activities over the following week to raise awareness and show opposition to the City's insistence on passing wave after wave of anti-homeless laws, that have done little to change homeless problems in downtown Fort Lauderdale. As it turns out, the appeal hearing for our federal lawsuit against the Fort Lauderdale sharing ban occurs two days after the passing of this new sharing ban law. 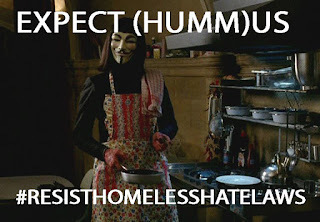 Food Not Bombs will also be sharing, as usual, at 4:30 pm at Stranahan Park on Friday, August 25th. At this time it is unclear as to what immediate effect the passage of the new sharing ban law will be on ours, or other sharings, occuring after August 22nd. The final vote for the new sharing ban law is Tuesday, August 22nd and will go into effect immediately after it is voted on. It's time to let the City know what people think of that...again! In 2014, the City of Fort Lauderdale passed a series of homeless hate laws, to which this blog was dedicated to reporting on. This week, the 2014 storage ban law became the 2nd of these laws sued in Federal Court for violating the civil liberties of homeless and homeless advocates that they were created to target. The storage ban has been a focus of controversy around Stranahan Park for some time. 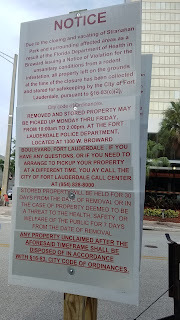 It was originally enforced in April 2016 by FLPD officers attaching removal notices to property stored along the sidewalk on the west side of Stranahan Park. However, enforcement seemed too controversial and poorly thought out, and the idea mostly faded away when the City and County created a de facto safe space in the grassy area in between the Main Library and Stranahan Park in November 2016. Last month the City launched a surprise raid of the Park, resulting in many people's important belongings being thrown out without prior notice as required by the storage ban law. In a surprising and fortuitous turn of events, Florida ALCU, with the assistance of Broward Chapter ALCU, not only took an interest in fighting back but managed to sign 16 people from Stranahan Park as plaintiffs. They are joined by Southern Legal Counsel, a Gainesville area public interest law firm that is also representing Food Not Bombs in its federal lawsuit against Fort Lauderdale's sharing ban law. Although panhandling ordinances similar to Fort Lauderdale's have been challenged or overturned in places like Pensacola and Gainesville recently, that law along with the "camping ban" and the public indecency rules affecting homeless people have yet to be challenged. Meanwhile, Stranahan Park remains closed and City representatives have been stonewalling anyone asking them when it will be re-opened. We hope to have more news about this soon. Just before 3 pm on Friday, May 20th, the City of Fort Lauderdale abruptly announced the temporary closure of Stranahan Park due to health concerns. Back in November, the City created a de-facto compromise with the help of the Main Library. Homeless people would no longer live on the sidewalk in front of Stranahan Park, but they would be permitted to stay in the small bushy areas in between the park and the library, fully on County property. The camp was allowed to take hold for quite some time, and many pallets were brought in and other ways to improve what was essentially a small patch of dirt surrounded by concrete. There was even a puppy that grew up there. 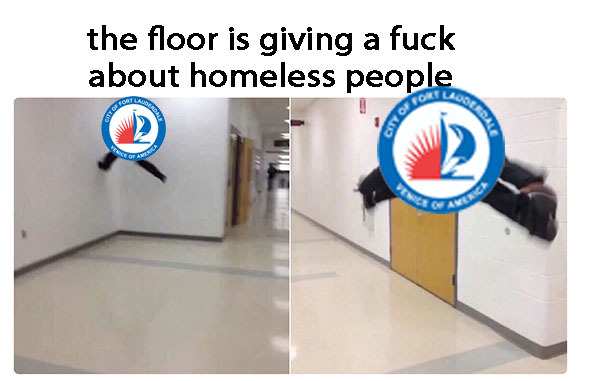 Recently, the City seems to have lost patience with the camp, whining about being seen as "weak" on homelessness at a recent joint workshop with the County, and most recently, held a secret meeting at the Women's Club last week where "dealing with homelessness" was the #1 priority. They spoke of getting rid of downtown food sharings as a "top priority" but didn't get into specifics there. But the Mayor and company were quite specific on their immediate desire to "clear out the park" and "clear out the 308," referring to the number of homeless people the county counted in January as not wanting help in housing, aka the "chronically homeless." The Mayor's candor towards the homeless was on its usual display as he rambled about how ridiculous it was to "give free wifi" to people that won't take their help. The Mayor also said he "absolutely" wants the area of Stranahan Park and the Main Library cleared of homeless people "nightly." 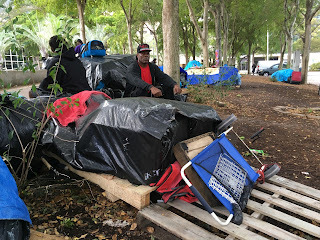 In the past, FLPD officers, Park Rangers, or others, have had some kind of communication with the homeless camp about what to expect coming up, and there have been some unfulfilled pledges to remove the pallets from the camp recently. However there was no advance warning to anyone there about Friday's eviction, which went well beyond what anything had been proposed before. A long series of recycle bins were brought to collect everyone's possessions and bring them to FLPD headquarters. 1 week vouchers for hotels and bus passes were handed out to some. Within an hour the entire camp was gone, and soon orange tape and signs created a new perimeter around all of Stranahan Park (except the Women's Club). 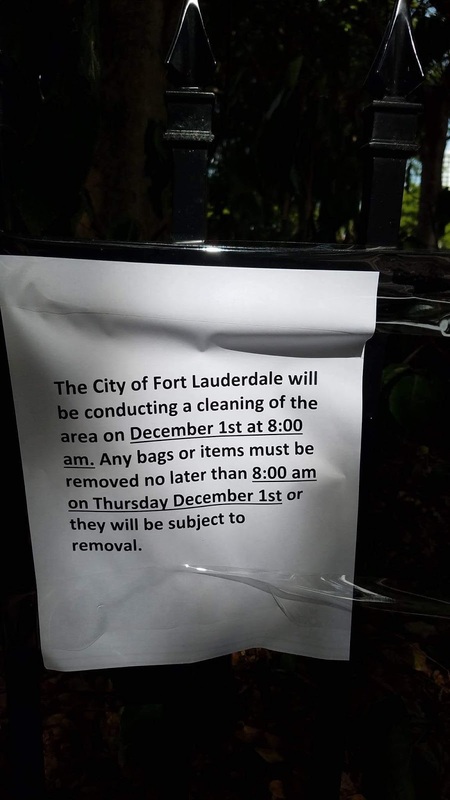 City Manager Lee Feldman & Mayor Jack Seiler then held a press conference at City Hall announced that the park was being closed for at least the next month in order to deal with the "health hazard" of rats at the homeless camp. And we'll repeat that...because there were rats at the homeless camp, they closed the entire Park, but not the Women's Club, all of which are a few feet away from each other. Talks of "political repercussions" came up quickly. 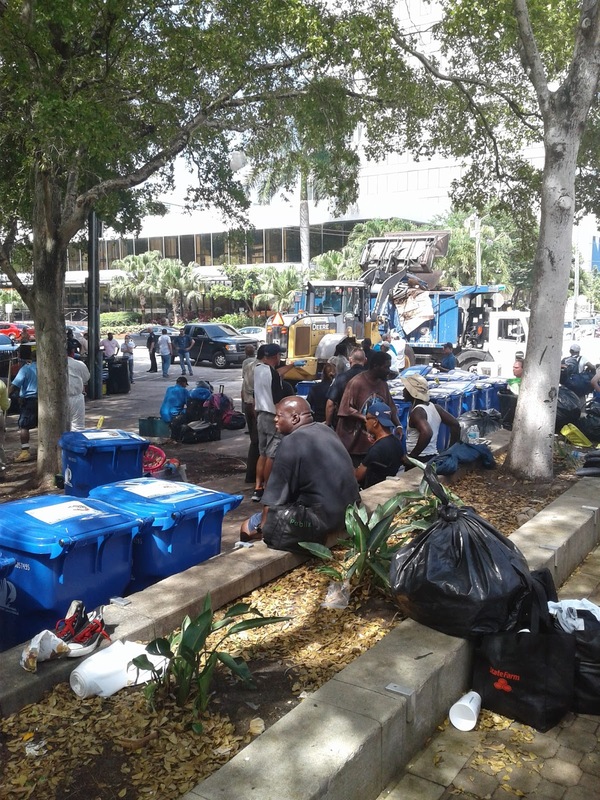 The City seems to have acted totally on its own with the eviction, with even Broward County Homelessness Board members finding out live on Facebook. It remains to be seen how the county will go along with this as the Mayor did not hesitate in repeatedly criticizing COC board members by name; the Mayor also claimed that Commissioners like Dale Holeness are now behind the Mayor in regards to ending food sharings. City Commissioner Trantalis, who just a year ago said he wanted all anti-homeless laws repealed, certainly said nothing like that at this meeting and was made out to be the City's little messenger boy for their future actions against the homeless. If the City actually acted on any more of these decidedly heavy handed attitudes towards the homeless, it would seem that suffering in downtown is going to greatly increase as people are scattered into smaller and smaller areas in downtown. Following Saturday's arrest of 7 Food Not Bombs activists in downtown Tampa, there has been another flurry of social media outrage regarding the criminalization of homelessness. 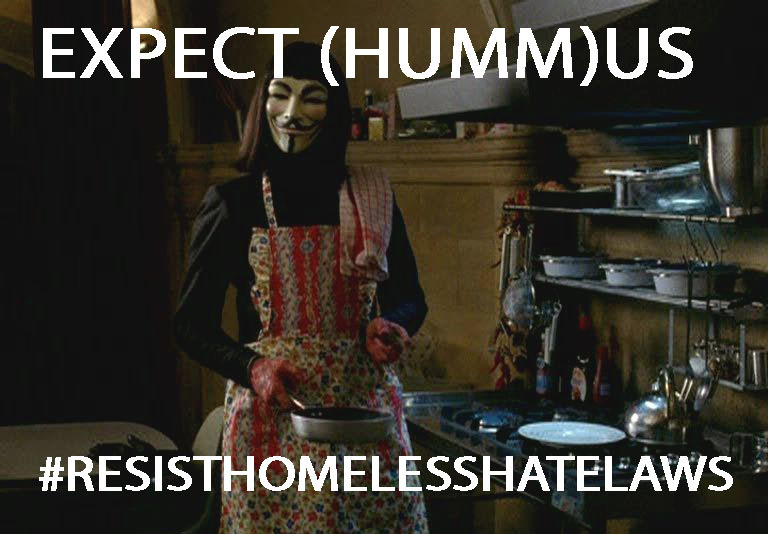 Like the last several times this has happened, there has been a flood of questions - how can sharing food be illegal? How could this happen? And so on. 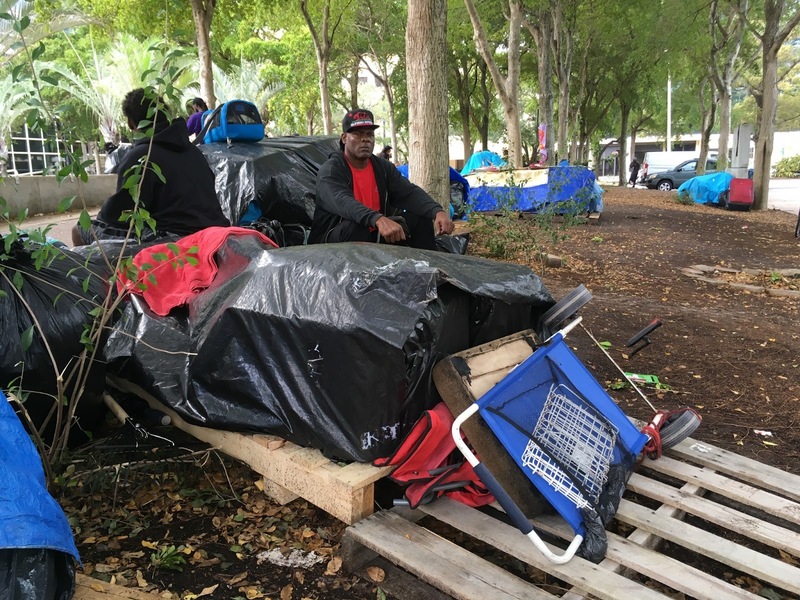 The criminalization of sharing resources with the homeless, along with so many other aspects of homeless life, is hardly a new phenomenon for Florida. Generally, homeless oppression goes on in all 50 states without as much as a whimper from the majority of Americans - it just tends to bubble to the top every once in awhile when it makes an attention-grabbing headline. As we saw so very well here in Fort Lauderdale in 2014, the accuracy of these articles is...highly variable - it's actually one of the main reasons this site exists. So for those who are once again hearing about the criminalization of food sharings for the first time, we are offering a brief, incomplete primer. This is not the first time this has happened in Tampa. 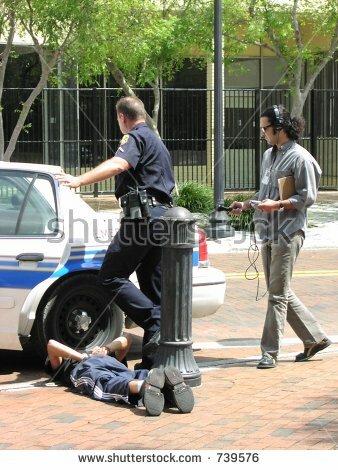 Tampa once specifically banned the sharing of food in public parks with the homeless, resulting in 5 arrests over the course of a couple of months in 2004. The City also fenced and largely shuttered Herman Massey Park, the park Tampa FNB shared out of back then, resulting in a period of dormancy for that FNB chapter. Eventually lawyers helping FNB convinced the City to reconsider enforcement of these laws due to the lack of legal standing the laws would have needed to withstand a potential lawsuit. When TFNB began to share again in new locations in 2011 or so, no serious conflict would occur again until the events of this past week, even during the heavily policed Republican National Convention of 2012. One of the longest running food fights in Florida history was that of Orlando Food Not Bombs versus the City of Orlando. Orlando FNB shared at Lake Eola Park in downtown Orlando for many years until the City planned a multi-million dollar facelift for that location and passed a law stating that sharings for more than 25 people in that park require a permit. After a few original arrests in 2007, the conflict became a legal battle for over 4 years, with FNB plaintiffs winning several times before the City finally got an appeals court to rule in their favor. 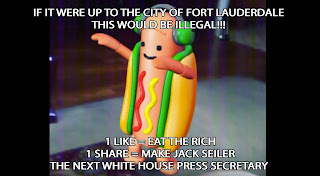 For about 6 weeks, over 25 food sharers were arrested, until the international bad press, hacking attempts, and general all-around outrage convinced Orlando to reach a compromise with FNB, allowing them to continue sharings at the nearby City Hall, and dropping all of their charges. To this day OFNB still shares at City Hall. In 2009, the City began to enforce a rule practically nobody had heard of which restricted food sharing services to 130 meals per 24 hour time period. This law was exclusively enforced against St Francis House, which was unpopular with local developers and City officials. The Coalition to End the Meal Limit NOW!, composed of Gainesville FNB, church groups, and others, fought for 2 years to end this food sharing law. Part of this story is told in the film "Civil Indigent," featuring the since-departed, irreplaceable, Pat Fitzpatrick. Sarasota tried to follow Orlando's lead in 2011 to cap the amount of people who can be shared with without a permit, and tried other measures such as banning smoking in public parks, but most of these ordinances did not stand up to legal scrutiny. You can read much more on Sarasota's terrible history with the homeless. Retired couple Chico & Debbie Jimenez were infamously fined over $2,000 by the City of Daytona Beach for their once a week food sharings. Their fines were later thrown out. Did you know a 90-year old chef was arrested multiple times in Fort Lauderdale in 2014? 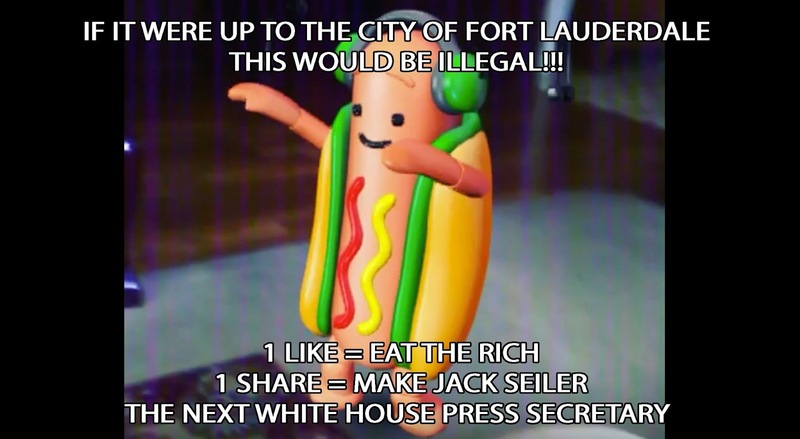 In reality, almost a dozen people were ticketed with sharing food in defiance of the City's sharing ban law in late 2014, and only 3 people (all with Fort Lauderdale FNB) were ever actually arrested, but the internet was flooded with outrage (as well as clickbait news stories that variously reported that Arnold Abbott was a pastor, that he was actually handcuffed and taken to jail multiple times, and so on). 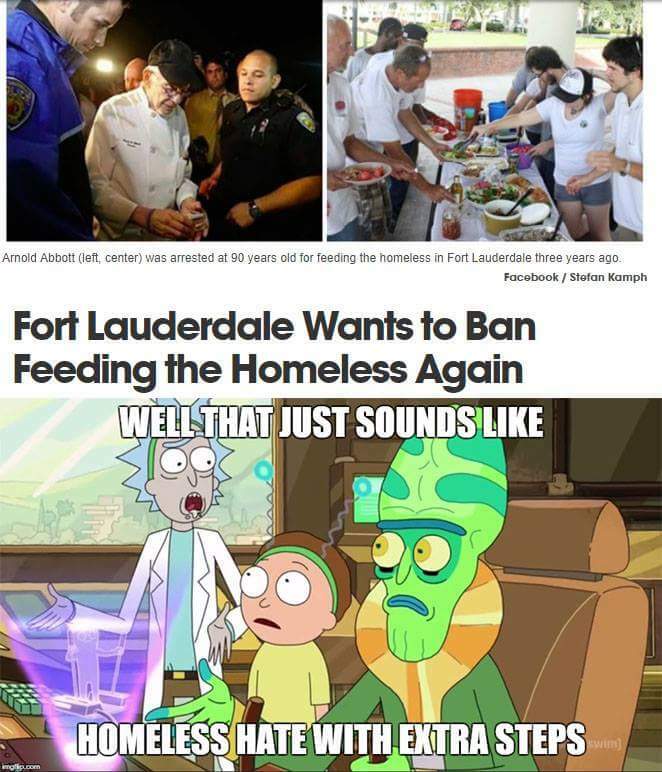 Currently the law is still in effect, but there are several lawsuits against the City, filed by Chef Arnold's group Love Thy Neighbor, and Fort Lauderdale Food Not Bombs, that prevent it from being enforced. 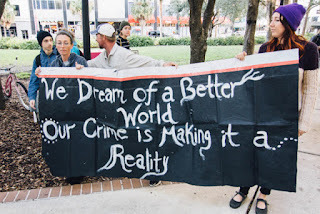 There's many more facets to the criminalization of homelessness, all across Florida. From Pensacola's attempts to criminalize the legal homeless tent site known as Sean's Outpost to the Big Brother-style attempts by St Pete to criminalize all homeless activities, there's far more than the occasional and outrageous sight of food sharers being arrested. We can post links about these problems all day (look, here's another good one) but you'd be better served by just scrolling the rest of this site, which has been documenting these kinds of enforcements for almost 3 years now. The next Tampa Food Not Bombs sharing is tomorrow morning. Notices and sticker tags went up on homeless property around the Stranahan Park area once again yesterday, November 29th. 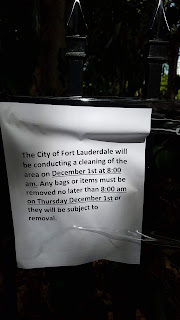 The notices say that the City will once again be cleaning the area tomorrow, December 1st, and anything left at 8 am that morning will be removed. Fort Lauderdale's Storage Ban was passed in 2014 and has been used very infrequently the past few months. In fact, one of the most consistent uses of enforcement so far has been when the Women's Club of Fort Lauderdale has a wedding coming up. That's been true in prior enforcements, and it is also true this week, as there is a wedding scheduled for 4:30 this Friday inside Stranahan Park. Matters of improper policing and class are often brought up in regards to issues surrounding Stranahan Park. The storage ban may be the clearest lesson yet - a law that is ONLY enforced when wealthy, influential people are intending to profit off of a public space, and need the area cleared out ahead of time. This issue has dragged on for years, and it has only gotten more ridiculous. One of our most in depth pieces on Stranahan was actually written due to the incessant rumors, spread by FLPD and Women's Club volunteers, that Stranahan wasn't a public park at all. Around the same time, the Women's Club induced the City to put a fence around the Park. Although this courtesy was not extended to any other organization that has been using the park on a regular basis for years, the Women's Club was conveniently given a key to the Park. In another weird twist, a church group that booked the Women's Club to do a Thanksgiving sharing for the homeless last year got a rude surprise when they tried to do it again this year - a last minute call from the FLPD announcing that their sharing was cancelled. Again, we have the same group of privileged individuals, using the police to have their own event pulled because they got cold feed about having too many homeless around. It is well past time that the Women's Club's ability to dictate how the homeless people around Stranahan are treated to end. Their ability to command the police to take away homeless people's belongings, in order for them to make a buck off a wedding, is absolutely repulsive.